Seeing the "Big Five" (Big 5) in the wild is one of the most memorable things one can ever experience. The African continent is the only place in the world where big game still roams freely in great numbers. In particular the Kruger National Park area and the neighboring private game reserves are famous for the incredible possibilities seeing the Big Five up close. The term "Big Five" (Big 5) is reminiscent of the old safari hunting days. The name is not derived from the size of the animals as many people believe. Rather, these five animals proved to be the five animals that were the most difficult to hunt. 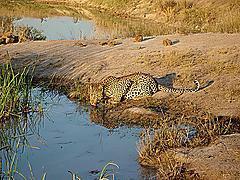 Manyeleti Game Reserve offers excellent possibilities for viewing Africa's Big Five. Many guests have a special place in their hearts for Buffelshoek and Ndzhaka, to the extent that they return time and again. Indeed, this fondness has even been passed on from one generation to the next. What, might you ask, makes the guests return? Of paramount significance is the excellent game viewing coupled with the relatively undiscovered beauty and tranquillity of Manyeleti Game Reserve but also undoubtedly of significance is the friendliness of the staff who make all feel at home. With a maximum of 10 guests per camp this ensures that each guest receives individual attention.